Nashville’s largest and longest-running home event, the Nashville Home Show, is scheduled September 8-10 at the downtown Nashville Music City Center with over 300 home building and remodeling experts, sessions with HGTV Curb Appeal and outdoor living expert John Gidding, and great DIY projects at the three-day event. This event promises homeowners the most comprehensive home improvement event in the city, on that will allow them to shop and compare under one roof, according to event producer Eric Udler. Avoid long times and buy tickets online at NashvilleHomeShow.com where you will also find information about nearby discount parking. Boosting home values by sprucing up exterior appearances will be taught during free home show sessions with John Gidding, an architect, designer, and host of HGTV’s Designed To Sell and Curb Appeal: The Block. Visitors can take his tips and find resources to implement their ideas at the home show. The new frontier in outdoor living is the backyard shed which will be showcased in a special shedquarters area of the home show. 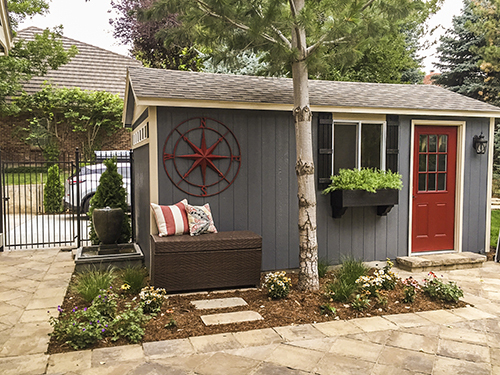 Tuff Sheds have been transformed into fun spaces by area designers Marcelle Guilbeau, DC 7 Designs, Decorating Den Interiors’ Bohnne Jones, and Designs By Tamerah. With Apple & Oak, an East Nashville boutique hosting the main stage, new companies and products also will be highlighted including imported exotic hardwoods for outdoor projects, new innovations in kitchen cabinets, flooring and shower walls, smart phone-operated home locks, and virtually unstainable bedding made in the U.S.A.
Popular Nashville area food bloggers will be demonstrating delicious recipes throughout the event including “That” Susan Williams, The Hungry Waitress, The Local Lady, Luv Cooks, My Paella Travels, Chelsea’s Choices, Lhyme, The Nutrition Adventure, Handmade Healthy, and Miranda’s Kitchen Adventures. Tennessee’s largest home event, the 34th Nashville Home Show features over 300 home industry experts from remodeling contractors, kitchen, bath, and landscape designers to inspiring ideas for outdoor living, sheds, pools and spas. Featuring curb appeal and outdoor living sessions with HGTV’s John Gidding, this can’t miss event for homeowners is September 8-10 at the downtown Music City Center. Save and buy tickets online at NashvilleHomeShow.com.